New York – March 21, 2016 – Fifty years after the Shelby GT350-H was introduced, Ford Motor Company, Shelby American and Hertz unveiled a special run of performance-modified 2016 Ford Mustang GTs named the Shelby GT-H that will be available for rent beginning Memorial Day weekend. As a throwback to the famed Shelby GT350-H “Rent-A-Racer” program of the 1960s, a total of 140 2016 Ford Shelby GT-H’s will be available exclusively through the Hertz Adrenaline Collection at select airport locations in the continental United States. As with the past two generations, the 2016 Ford Shelby GT-H is instantly recognizable with several styling enhancements that celebrate its heritage. 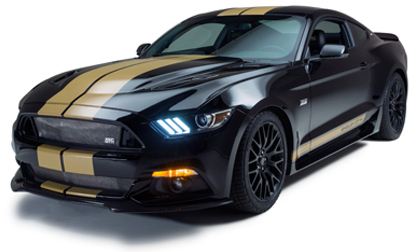 Each Shelby GT-H will wear black exterior paint, set off with gold racing stripes, a hallmark of Hertz vehicles dating back to the 1920s.Shelby’s traditional “Le Mans” dual racing stripes are combined with a set of rocker stripes that include special “Shelby GT-H” nomenclature. Each car will also wear a Hertz Edition emblem on the front fenders, and feature Hertz Shelby GT-H sill plates and a numbered badge. To hint at the 5.0liter V8 engine’s capabilities, the Ford Shelby GT-H is fitted with a unique Shelby-designed vented hood, carbon fiber front splitter and rear spoiler. Special badges appear in the front grille, rear faux gas cap and trunk lid. Inside, Shelby GT-H logos are on the head restraint, sill plates and floor mats. Shelby American will build the cars at its assembly facility in Las Vegas. With total production expected to number only around 140 units exclusively destined for Hertz rental fleets across the country, this special-edition car will give Hertz customers a truly exclusive driving experience. To watch the build of a Shelby GT-H, visit www.shelby.com. To learn more about the 2016 Shelby GT-H, visit www.hertz.com/ShelbyGTH. To reserve other vehicles available through the Hertz Adrenaline Collection visit www.hertz.com. Hertz Adrenaline Collection vehicles may also be reserved through travel agents or by calling Hertz toll-free at (800) 654-3131. Hertz Global Holdings operates the Hertz, Dollar, Thrifty and Firefly car rental brands in approximately 9,980 corporate and licensee locations throughout approximately 150 countries in North America, Europe, Latin America, Asia, Australia, Africa, the Middle East and New Zealand. Hertz Global Holdings is the largest worldwide airport general use car rental company with approximately 1,635 airport locations in the U.S. and more than 1,320 airport locations internationally. Product and service initiatives such as Hertz Gold Plus Rewards, NeverLost®, Carfirmations, Mobile Wi-Fi and unique vehicles offered through the Adrenaline, Dream, Green and Prestige Collections set Hertz Global Holdings apart from the competition. Additionally, Hertz Global Holdings owns the vehicle leasing and fleet management leader Donlen Corporation, operates the Hertz 24/7 hourly car rental business in international markets and sells vehicles through its Rent2Buy program. The Company also owns Hertz Equipment Rental Corporation (“HERC”), one of the largest equipment rental businesses with approximately 280 locations worldwide offering a diverse line of equipment and tools for rent and sale. HERC primarily serves the construction, industrial, oil, gas, entertainment and government sectors. For more information about Hertz Global Holdings, visit: www.hertz.com.